Updated Monday December 31, 2018 by Bear Babe Ruth. You may sign your child(ren) up to play at Bear Babe Ruth if you live within our boundaries, or if the school you child attends for the 2018/19 school year falls within our boundaries. Note: This excludes home schools, cyber schools, sports-related schools, sports academies, or after school where a student participates outside of the primary school in which the player is enrolled. Once a player selects to participate in a league where the player is eligible, the player must finish the current season in the same league under the school boundary rule. Please contact Tom Pritchard at tepritchard@comcast.net with questions. If you are receiving an error message when you attempt to register, but feel your child(ren) qualify to play for Bear Babe Ruth due to school boundary rule, playing for our league last season, or grandfather rule, please email TOM PRITCHARD at tepritchard@comcast.net to ask for help with any questions on this and/or completing your registration. If you receive a message stating that your address needs to be verified, you need to submit a “proof of residence” document (electric/gas bill, water bill, utility bill, cable bill, etc., that has the company’s name, your name, and your home address clearly written on it). If you are registering based on the “school boundary”, you will need to provide proof of school attendance. Please do remember that any new player to the league still needs to provide a copy of each child’s birth certificate for the league to keep on file. If you have any questions, please email Tom Pritchard at tepritchard@comcast.net. Any volunteer position will require you to sign up as yourself (add yourself as an adult in your account). We no longer have the option to mark volunteer assignments under your child’s registration. This is so we can more easily report on volunteer names and do not accidentally miss anyone due to multiple ways of signing up for a volunteer position. Additionally, all volunteers will be required to complete a background check through our registration site ($22 charge). The registration site allows us to do this as a mandatory step. The safety of the children who play in our league is of the utmost importance, and we are entrusting that safety to all of the volunteers in our league. In addition to these volunteer positions, all members of the Board of Directors are also required to complete a background check. Should you pass the background check and for some reason are not selected to be a manager, rostered coach, umpire, or other position for our league, you may request a refund of your $22. Your privacy is also very important, so only two people will receive the result of the background check. The first is you and the second is the league president (Tom Pritchard). If you have any questions about volunteering, please contact Tom at: tepritchard@comcast.net, OR your division coordinator whose name can be found on the league website under the Division Coordinators link. Manager = Manager of a team. You’re in charge. You schedule and run the practices with help from our and your coaches. You set the lineup and determine substitutions throughout the game. You will be in contact with the division coordinator throughout the season for any changes/issues/questions about your team or the league in general. As the manager of the team you are guaranteed to have you own child(ren) on your team. Coach = Team coach who assists the manager with running the team. Responsibilities will be delegated to you by the team manager. Team Parent = Team coordinator for non-game activities. These activities can include, but are not limited to: team pictures, league fundraising, after game snacks, etc. Umpire = Game umpire for baseball (AAA 46/60, Majors 50/70, Seniors 60/90, and Super Seniors) and softball (Minors, Majors and Seniors). Umpires are paid a fee for each game. You will work with the League Umpire Coordinator (both senior umpires and junior umpires) throughout the season for scheduling. Auxiliary Committee = We need volunteers not only to work in the Snack Shack, but also people to work shifts as the person in charge, who will assign jobs to workers, determine the needs for cooked food, and work with the Officer in Charge (Board of Directors member) with counting and completing the deposit for the end of the day. Other = If there is another position not listed, please select this option and place a note in the box explaining how you would like to help out the league and a member of the Board of Directors will contact you. At these open registrations we will help you create an online account and complete your registration. Please bring a credit card (Visa or MasterCard) or check (made payable to Bear Babe Ruth League) with you. 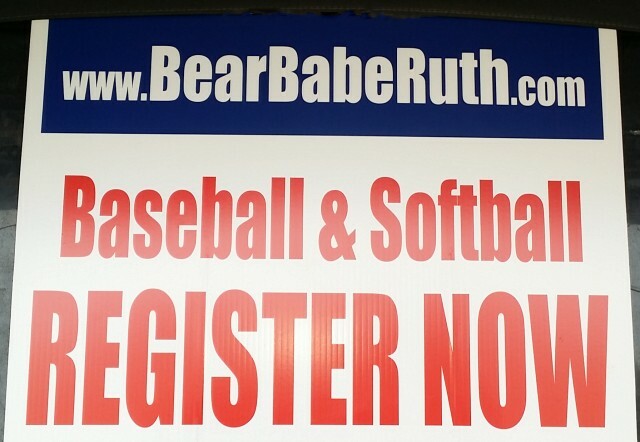 If you are new to Bear Babe Ruth and would like to register your child(ren) to play baseball and/or softball for the 2019 season, please bring a copy of your child’s BIRTH CERTIFICATE and PROOF OF RESIDENCE (I.E., utility bill, sewer bill, cable bill, etc.) OR PROOF OF SCHOOL ATTENDANCE (for those that live outside our boundary) on one of our open registration dates. Please make sure to read all included as it may affect you. Playing Age: Playing age for baseball is determined by the player’s age on April 30, 2019. Playing age for softball is determined by the player’s age on December 31, 2018. See the chart below depicting options for each age group. Registration: The respective division(s) your child(ren) are eligible for will be available based on the player’s “playing age”. We will use this registration selection to group divisions for try-outs. Those that have registered in the AAA 46/60 division will try-out as a group and will ONLY be eligible for that division (not the 50/70 division). Registering your 10 year old for the 50/70 division is not a guarantee that they will be selected for that division. If we receive more registrations than we have spaces to fill our teams, it is possible your 10 year old could be moved to the AAA 46/60 division if they are not drafted during the Major 50/70 draft. Tryouts: Tryouts for Major Softball, Minor Softball, AAA 46/60 Baseball, and Major 50/70 Baseball divisions will be held on Saturday, March 9, 2019, at (place TBD) starting at 8:00am. Your child's tryout time will be emailed to you the week before tryouts. Tryouts for Senior Baseball and Super Senior Baseball will be held at a later date. We will update this site and our league website as soon as we confirm dates and places for those tryouts. Please read each description below and give some thought to which division is the best fit for your child prior to registering. This division is our first introduction to baseball and combines players hitting off of a tee and/or coaches pitching to the batters. Games will be played on our all dirt infield "A" ball field located right next to the Snack Shack. Special Requests will try to be honored, but are not guaranteed. This is considered a non-competitive division. This is our machine pitch division. This is an instructional division where players are rotated through defensive positions frequently. The batting order will always involve the entire team. Special Requests will try to be honored, but are not guaranteed. There are no playoffs for this division. This is considered a non-competitive division. A competitive division where the kids get their first exposure of live pitching from other players. The bases are set to 60 feet and the pitching rubber is set to 46 feet. There is no leading or pitcher balks in this division. Teams are selected via a live draft; therefore special requests are not accepted for this division. All players are eligible to be nominated for state all-star teams. Our 50/70 division is the most competitive of the “Cal Ripken” (Ages 4 to 12) divisions. The bases (70’) and pitching rubber (50’) distances are increased. Runners are able to lead-off and pitchers pitch from the stretch with runners on base. This division’s objective is to help the player transition to the 13-15 Babe Ruth level where the game is played on a bigger field (90’ bases and 60’6” pitching). Teams are selected by each manager via a draft. This division is a competitive division. The game is played on a bigger field with the bases at 90' and the pitching rubber at 60'6". Teams are selected by each manager via a draft. This division is a competitive division. The game is played on a bigger field with the bases at 90' and the pitching rubber at 60'6". More information on team selections and play dates to come. Any specific questions, please contact Tom Pritchard or the Division Coordinator. Special requests in the A and AA (for baseball) & Rookie (for softball) consist of the following: Asking to be on the same team as another player and/or being on a certain coach’s team. It may also include to NOT be on the same team as another player and/or coach. We do our best to fulfill every request but that is not always possible, so these special requests ARE NOT GUARANTEED. This division is a competitive division where players get their first exposure to live pitching from other players. Stealing bases is allowed on a limited basis. Teams will be selected via a live draft. Special requests will NOT be accepted for this division. Pitching distance = 35 feet. This division is a competitive division where the players pitch the entire game and stealing bases is allowed. Players are selected by their manager via a draft. Special request will NOT be accepted for this division. Pitching distance = 40 feet. All-Star Eligibility (baseball): To be eligible for the 8 and 9 year old all-star teams, the player MUST play in the AAA 46/60 division. All players that are 10 years old, whether playing in AAA 46/60 or Majors 50/70, are eligible to be nominated for all-stars. To be eligible for the 11 and 12 year old all-star teams, the player MUST play in the Major 50/70 division. All-Star Eligibility (softball): All 7 and 8 year olds are eligible to be nominated for the 8U All-Star team. All 9 and 10 year olds are eligible to be nominated for the 10U all-star team. All 11 and 12 year olds who play in the Major Division are eligible to be nominated for the 12U All-Star team. Payment/Fees: Visa and Mastercard Credit/Debit Cards (to make a payment via check, please contact Tom Pritchard at tepritchard@comcast.net). Multi-Player Discount: If you have more than one child playing in our league you will receive one of the following discount(s): $10 off for registering a second child. $20 off for registering a third child ($30 total discount). $50 off for registering a fourth child ($80 total discount). $50 off for each additional child above four children ($130 total discount for five children, $180 discount for six children, etc.). Late Registration: Certain divisions have tryouts and drafts that must be completed in a timely manner. A late fee will now be charged for our 12 and under competitive divisions for any registrations after March 8, 2019. Refund Policy: Bear Babe Ruth League will offer a full refund less a $25 administrative fee to any parent/guardian whose child is withdrawn from the league prior to the respective deadline. Any refund requested for a registered player after tryouts, team selections, or March 8th (whichever comes first depending on the division), will be denied. Any exceptions to this refund policy must be approved by the Bear Babe Ruth Board of Directors. Please email a detailed reason to the League President who will submit to the Board for approval/rejection. Refunds will be processed back to the credit card used during the registration. If not available, a check will be cut and mailed within two weeks of the approved request. Refunds approved by the Board of Directors as an exception to the rules above are done so under the condition that the child's team uniform is returned to Bear Babe Ruth in its new, unworn condition. Uniforms, not returned in a new condition are subject to having the cost deducted from the refund. Snack Shack Retainer: We require a $25 retainer (per family) at registration for your snack shack commitment. Once you have completed your snack shack assignment you will be eligible to receive your retainer back. Information on how to sign up/pick dates for your Snack Shack shifts will be sent out via email and available on the website after registration. Snack Shack Obligation: We will be using an online scheduling website that will enable you to pick your Snack Shack shifts dates. All Shifts will last 2 hours. Each family must work one 2-hour shift per child to obtain their retainer refund. Refunds will be issued on a monthly basis as refund requests are received. Mandatory Fundraising: We require a $50 Fundraising Fee per family. Each family will receive 5 discount cards that contain discounts to various local businesses on them which can be sold for $10 each. Because this fee is paid up front, after you have sold the cards, you keep the money. The league will notify you when and how the cards will be distributed, most likely some time in March, and no later than Opening Day. The Babe Ruth Baseball/Softball program, using regulation competitive baseball and softball rules, teaches skills, mental and physical development, a respect for the rules of the game, and basic ideals of sportsmanship and fair play. In all aspects, Babe Ruth League, Inc., is committed to providing our participants the very best educational, sports experience possible. It is our fundamental belief that every child with a desire to play baseball or softball be afforded that opportunity.